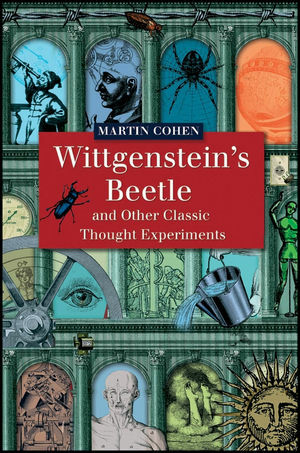 Wittgenstein’s Beetle and Other Classic Thought Experiments invites readers to participate actively in discovering the surprisingly powerful and fruitful tradition of "thought experiments." Includes illustrations, mini-biographies, and suggestions for further reading. Martin Cohen is a teacher and writer specializing in philosophy, ethics and education, with a special interest in computing. His books include 101 Philosophy Problems (2nd edn., 2001), Political Philosophy (2001) and 101 Ethical Dilemmas (2003). He has been editor of The Philosopher since 1995. "Martin Cohen's book is a delight to the intellect. His discussion of historically important thought experiments displays considerable erudition, permeated by wit and occasionally farcical invention which embellish the philosophical value of his treatment." "Cohen's book is packed with wit and scurrilous remarks about mainstream philosophers. His inimitable writing style, which entertains as it instructs, is directed towards making philosophical ideas immediately accessible to the general reader." "One of the fun things about philosophy is that you can sit back in your armchair, set up a laboratory in your own head and calmly observe the results of mixing x with y. This is the grand tradition of the "thought experiment", to which Cohen provides a zippy alphabetical guide. Cohen's explanations of the problems are lucid, and he defends the tradition against killjoys who argue that thought experiments cannot ever give reliable conclusions. At its best the thought experiment can be a highly compressed, conceptually fruitful marriage of science and literature." "The value of this little book is that it collects a wide range of thought experiments and presents them in an accessible way. It is a good place to start, and it will be especially useful for those who teach courses on the topic and want to introduce it to a new generation of students." "There are several books of philosophical thought experiments currently in print... Cohen's A-Z are mostly of historic significance to science. They are wittily presented..."